The Highgate Poets are a lively and talented group of North-London-area poets with whom I have had the pleasure of associating for over a year now. They have been publishing an anthology of member poems every other year since their founding in 1977. 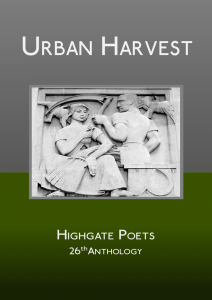 I am delighted to have two poems in their newest anthology, Urban Harvest, and pleased to announce that it is now available for sale online at their website. The book ships throughout the UK, however you can also contact the group coordinator if you are interested in ordering from abroad.